A couple of weeks ago, Cartoon Network angered Young Justice fans worldwide with the announcement that the animated series would not be renewed for a third season. 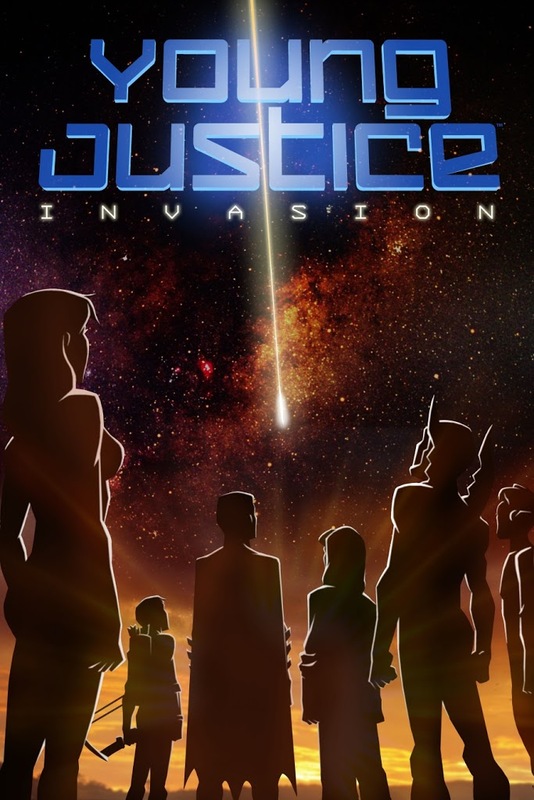 All 20 season two episodes will air, the first ten of which are now available on Warner Home Video’s two-DVD set Young Justice Invasion: Destiny Calling – Season 2, Part 1. It’s not hard to understand why the show’s loyal fan base is so pissed off. The 26-episode first season of Young Justice took the junior Justice League members in all sorts of directions, creating a multi-layered story arc that was always fun for younger viewers but also mature enough to hook adults. Amidst all kinds of comic book action, the characters interacted in a kind of soap opera-ish way. Teenage angst, on-again/off-again relationships, and young adults struggling to prove themselves to their adult superiors ensured a large following from both male and female viewers. So why is it not continuing? I have no idea, but here’s my best guess: Young Justice is too complex, with too many characters, to attract new and/or casual viewers. That’s not a knock against the show. When season one ended with “Auld Acquaintance,” six Justice League members— Batman, Superman, Hawkwoman, John Stewart, Martian Manhunter, and Wonder Woman—has been mind-controlled for 16 hours and no one among them remembered what occurred during that time. Season two’s “Happy New Year” picks up five years later. Soon the League is dealing with the consequences of those “missing” hours (an attack on the planet Rimbor that made the League intergalactic wanted terrorists). With new Young Justice members, including Blue Beetle, Beast Boy, Wonder Girl, Batgirl, and Beast Boy, there’s a whole lot of new subplots and backstories to follow. 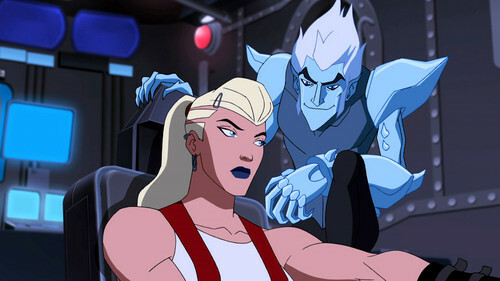 Meanwhile, former team leader Aqualad is now bad, still reeling from the death of Aquagirl. Red Arrow and Cheshire continue searching for the presumed dead original Roy Harper. Bart Allen (aka Impulse), grandson of Flash, arrives from the future to take part in a battle against new supervillain Neutron. And that’s just a small sampler of the various machinations at play in these ten episodes. So while the quality of the writing, voice acting, and animation remains as high as it was in season one, this is a show that is perhaps too complex for its own good. Joining in progress will make this all seem like gobbledygook. Fans will love having the first half of season two on DVD and anxiously await the eventual release of the second half. 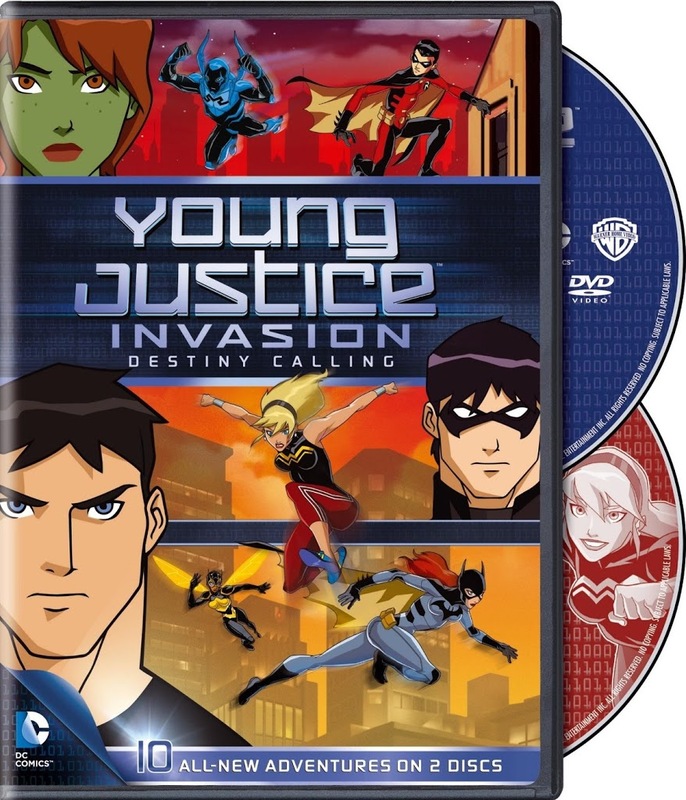 So for them, Young Justice Invasion: Destiny Calling – Season 2, Part 1 (which includes three episodes of Batman: The Brave and the Bold as a bonus) is a must-have release. For any other interested parties, start with the very beginning of season one (the full first season is also available on DVD from Warner Home Video). I’m really going to miss this show. It was honestly really good.